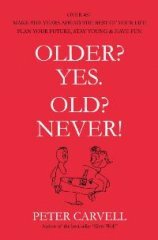 People's Book Prize - Book : Older? Yes. Old? Never! If everybody (employers, employees) read this book then perhaps everybody would have a better understanding and solutions for the future . Strikes could be avoided. Instead of gloom everybody could look a brighter outlook. Highly recommended. Inspirational and I am confident it will help me face the future with a positive different outlook. Highly recommended. At 66, so refreshing to read something that focuses on those with life experience. 'Good on you, Peter', as they say in Sydney.